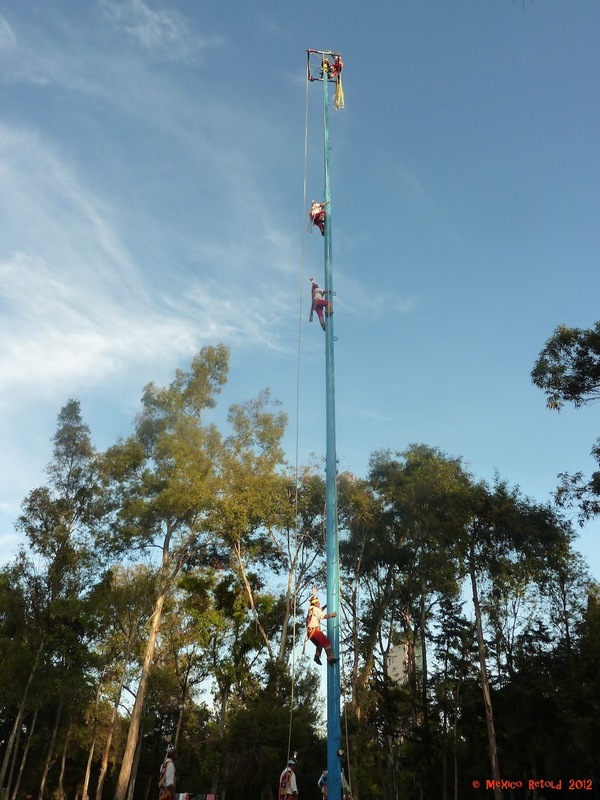 Walking through Chapultepec Park in Mexico City yesterday, we heard the unmistakable calls of the flute of the Voladores de Papantla (Papantla Flyers) whistling through the trees. 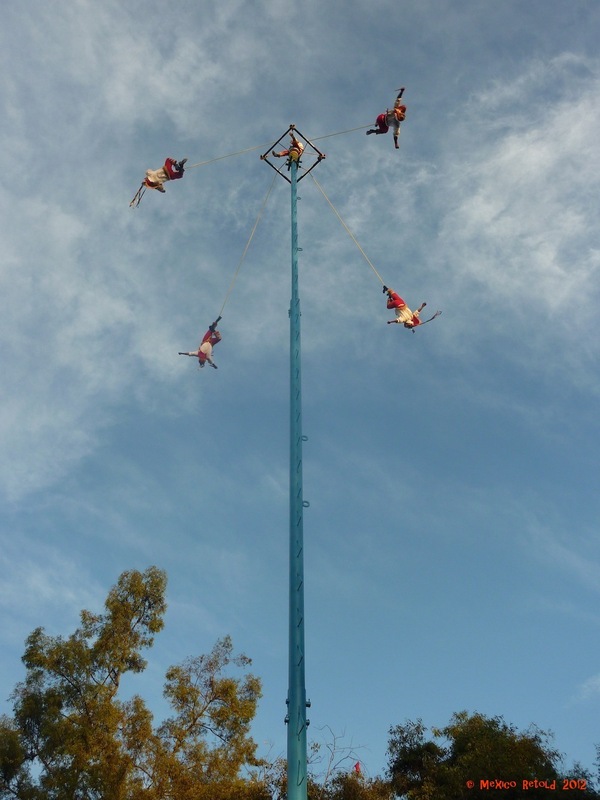 Drawn in, we ran quickly to watch the truly spectacular sight of the La Danza de los Voladores (Dance of the Flyers). Now mainly a tourist attraction, this traditional ritual was representative of the four seasons and was first undertaken during a severe drought to ask the gods to send down rain for the crops. 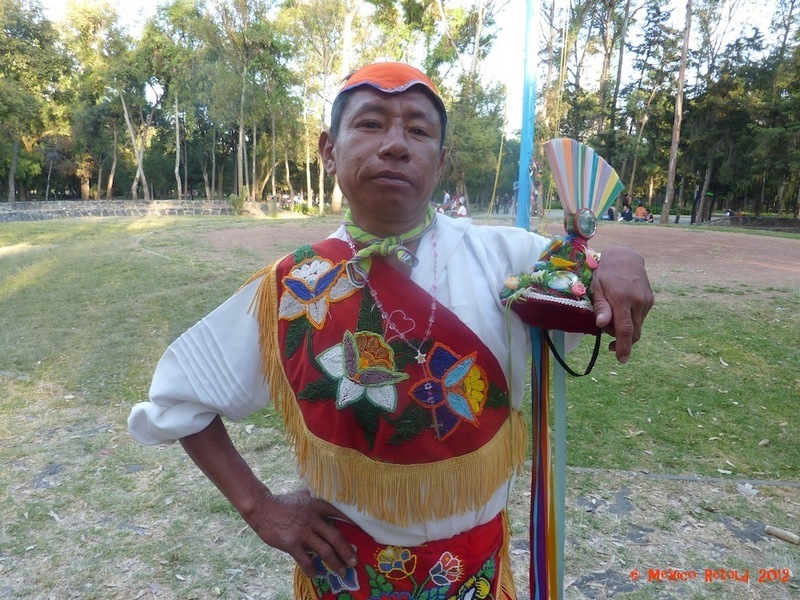 The ritual starts with five men dancing around a thirty meter tall pole to ask permission from the gods to climb it. 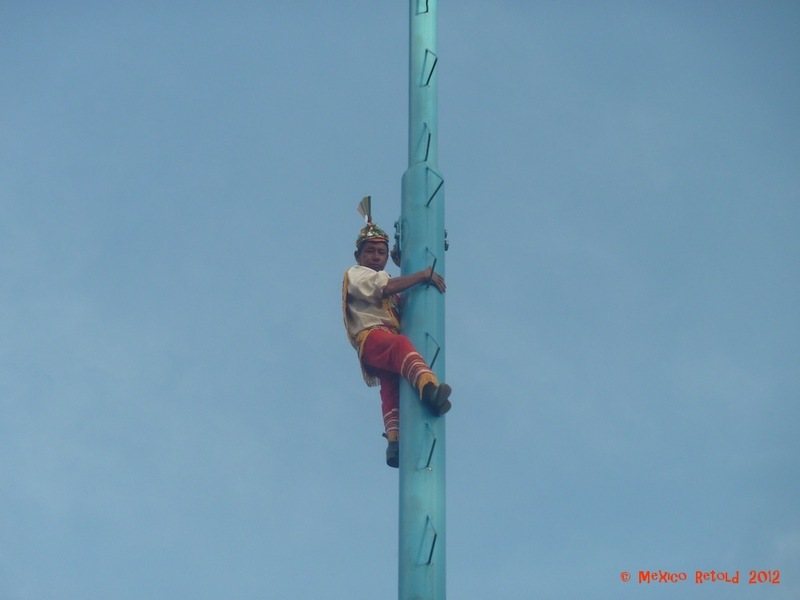 Once permission is obtained, the five men free-climb the pole with no ropes or supports. When they reach the top one man remains there playing a drum, whilst the other four (representing each of the four seasons) spin around and down attached to ropes they tied to themselves at the top. One of the “flyers” plays the flute as he descends through the air. I have seen this UNESCO recognized ritual a number of times and it is always truly incredible to watch. The overwhelming feeling is that the men look so calm, relaxed and almost meditative as they spin upside down to the ground. Whilst spinning they move to form different postures that look extremely elegant and graceful. Their traditional costume is so colourful and bright that they look like birds spinning down from the sky. Talking to the men, they told us that they were all Totonacas (an indigenous people) from Papantla Veracruz. Although it is apparently likely that this ritual did not originate with the Totonacas it is now highly associated with them. 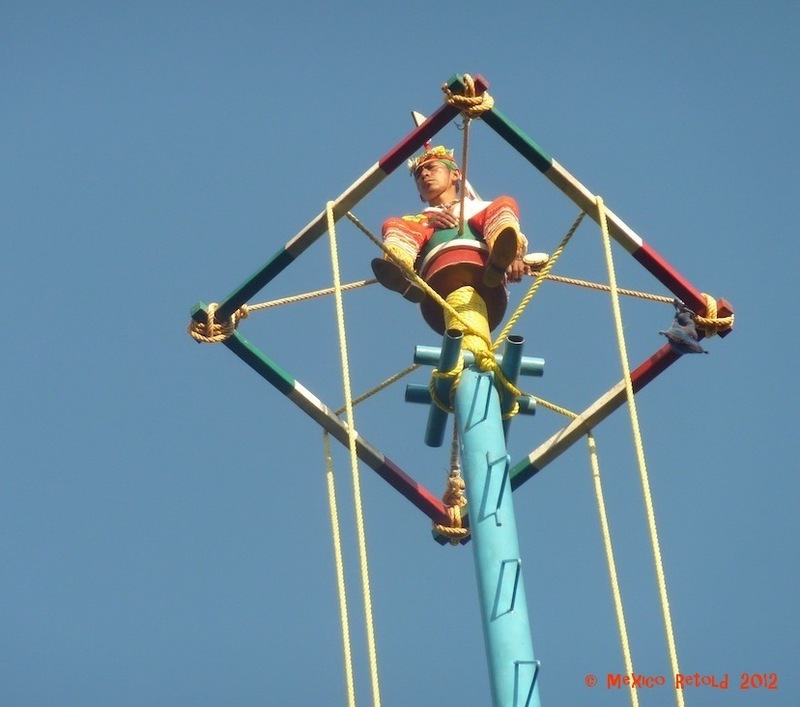 There are 70 groups of Voladores around the world and 600 men in total. To start “flying” you have to be 14 but the oldest flyer, Don Gabino is 70. Flying takes a lot of training and is seen as a vocation and as I understand it only men can be flyers. The second oldest flyer, was there yesterday and at 55 he had been “flying” for 34 years. As we spoke to him he was about to take his 18th “flight” of the day. Life is not easy as a flyer. These particular flyers perform the ritual outside the Museum of Anthropology in the heart of Mexico City’s museum district. 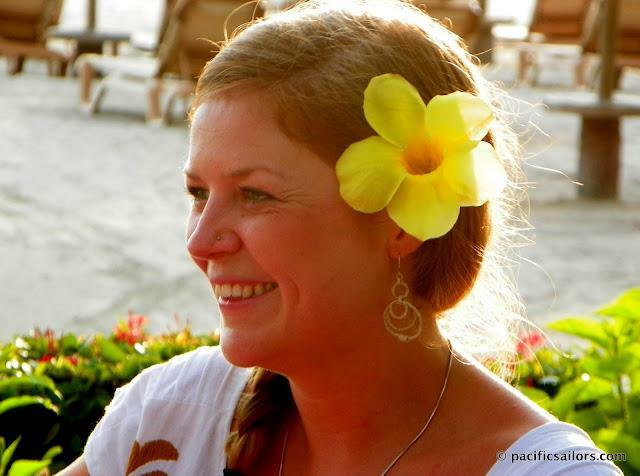 However, they are not paid by the museum as one would imagine but survive from money given by willing tourists, which can fluctuate from season to season, much like the crops this ritual was originally undertaken to protect. Our 55 year old friend rather cynically told us which nations were good tippers and which were bad, then asked us for a contribution, with a rye smile reaching his strong, stoic features. He waved at us as he ascended for his 18th flight and I could barely look. He jokingly raised his leg and wobbled a little and I held my breath and hid my eyes. 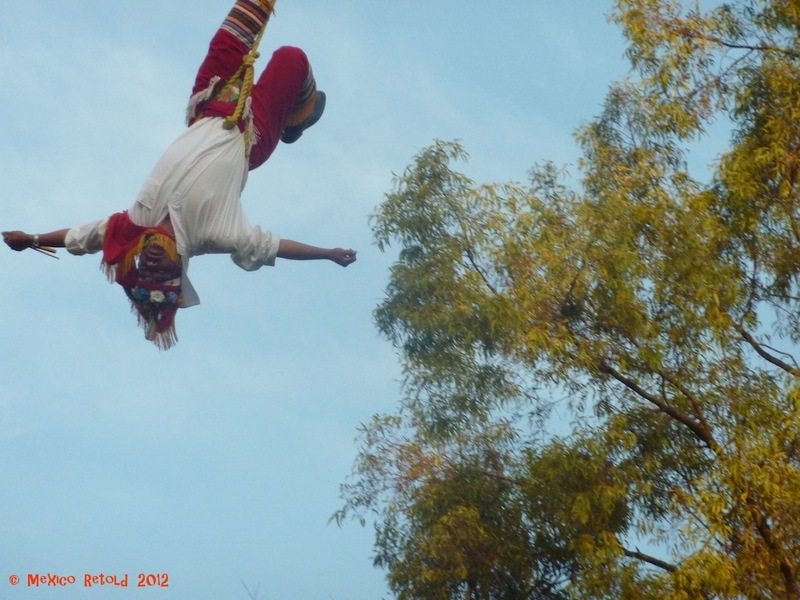 Just a month ago, we were told, a “flyer” had fallen to his death in Jalisco due to a badly knotted rope. However, as he descended gracefully, I thought of a question asked to him by a little boy in the crowd “Don’t you fall?” to which he responded nonchalantly “Well, if I fell, would I still be standing here?” I took some small comfort from that and opened my eyes in time to watch his safe arrival to the ground once again.